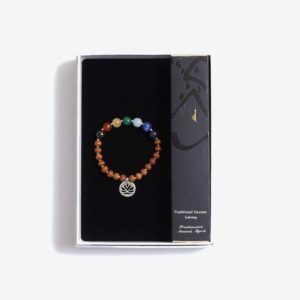 This yoga gift set comprises of a ‘Made By Yogis’ Sandalwood Chakra Bracelet, including seven beautiful chakra stones traditionally associated with chakra healing and balancing. The bracelet also features a Lotus flower charm (available in gold, rose gold and silver) traditionally believed to aid spiritual growth. 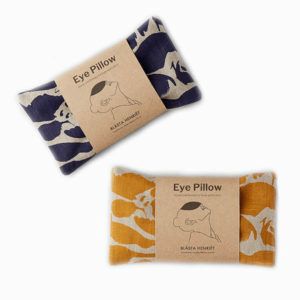 The gift set includes an essential oils roller containing the earthy and woody essential oil Palo Santo – also known as “Holy Wood”, which is used by Shamans to cleanse and heal. 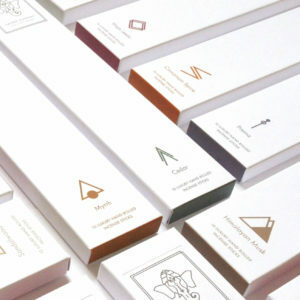 ‘Take a Breath’ Gift Box gives you 10% off the total price of the collection and a beautiful free gift box worth £5. Medium size ‘Healing Intentions Gemstone and Sandalwood 7 Chakra Bracelet’ and Palo Santo sacred perfume oil (10ml) including ‘Take A Breath’ gift box. 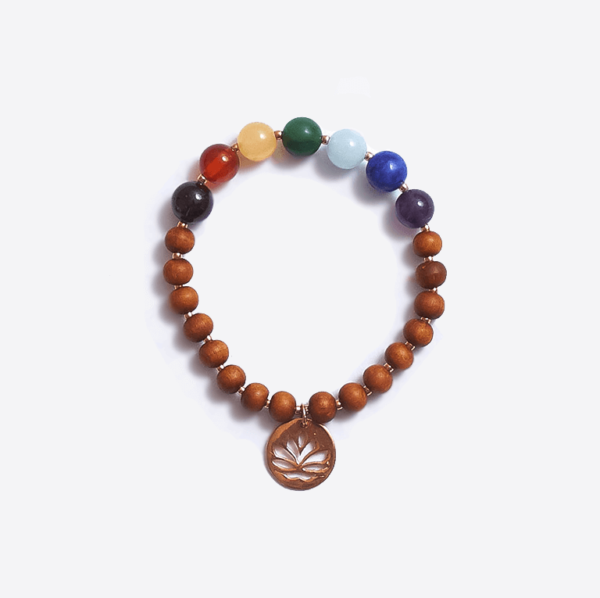 Is made with 7 x 8mm gemstones – one each of Amethyst, Sodalite, Aquamarine, Green African Jade, Ambronite, Carnelian, and Garnet – to represent each of the 7 Chakras, complemented by 6mm Sandalwood beads. Lotus charm is 15mm diameter with a sterling silver base. Coated with a choice of sterling silver, 24 carat gold or 18 carat rose gold vermeil, and corresponding 2mm spacers. Strung on elastic cord. 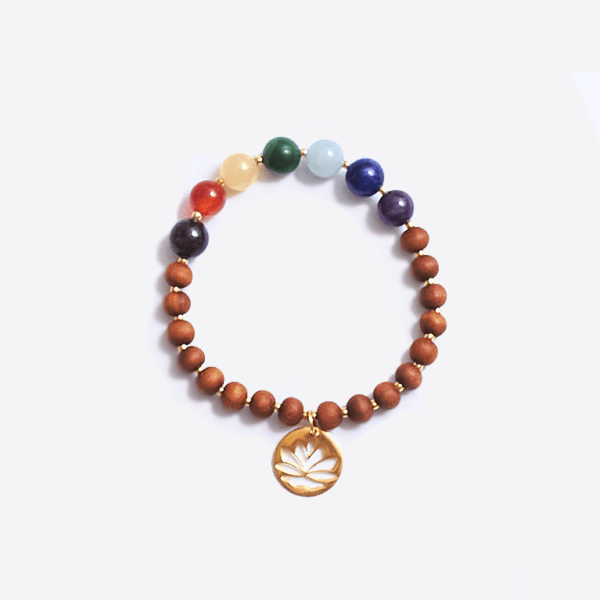 Every mala bracelet is beautifully handmade by yogis, with love and positive energy. 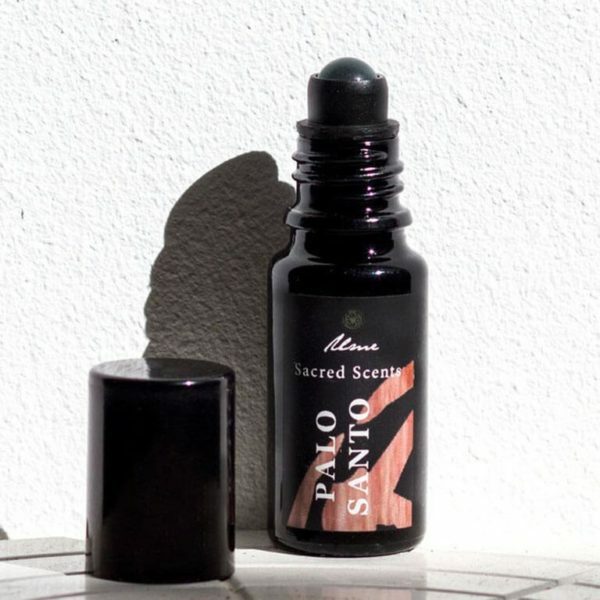 Palo Santo sacred perfume oil (10ml) is made with the unique, earthy and woody essence of “holy wood” or Palo Santo Oil. This grounding 100% natural roll-on scent has been created by hand by blending the finest quality essential oils. Palo santo (“holy wood”) is a tree that inhabits Central and South America. The tree belongs to the same family as frankincense and myrrh. It is widely used in folk medicine by indigenous shaman to cure many diseases; this is the reason why the Spanish settlers called the tree “Santo”. Gemstone for the Crown chakra – Purple Amethyst for wisdom and spiritual growth, understanding and guidance. Gemstone for the Third Eye Chakra – Indigo Sodalite for rational thought, insight and intuition. Gemstone for the Throat Chakra – Blue Aquamarine for self-expression and communication, truth, and trust. Gemstone for the Heart Chakra – Green African Jade for harmony, tranquillity, love and happiness. Gemstone for the Solar Plexus Chakra – Yellow Ambronite for positivity and self-confidence. Gemstone for the Sacral Chakra – Orange Carnelian for energy, awareness, creativity and passion. Gemstone for the Root Chakra – Red Garnet for strength, stability, and endurance. Sandalwood beads – Calms and focuses the mind, soothes the soul, enhances your meditation and increases the power of your intentions. Lotus Charm – For our unfolding journey, helping us rise and bloom, transcend obstacles and enjoy spiritual growth. Gemstones and Sandalwood beads are made of natural materials and will vary in size, shape, and colour. 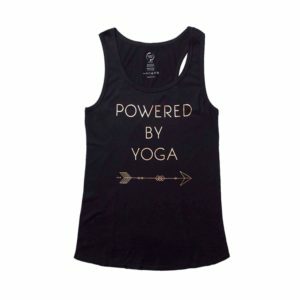 All claims are traditional in nature and not based on medical fact. This bracelet is not intended to diagnose or treat any health condition and is only intended as a spiritual aid. 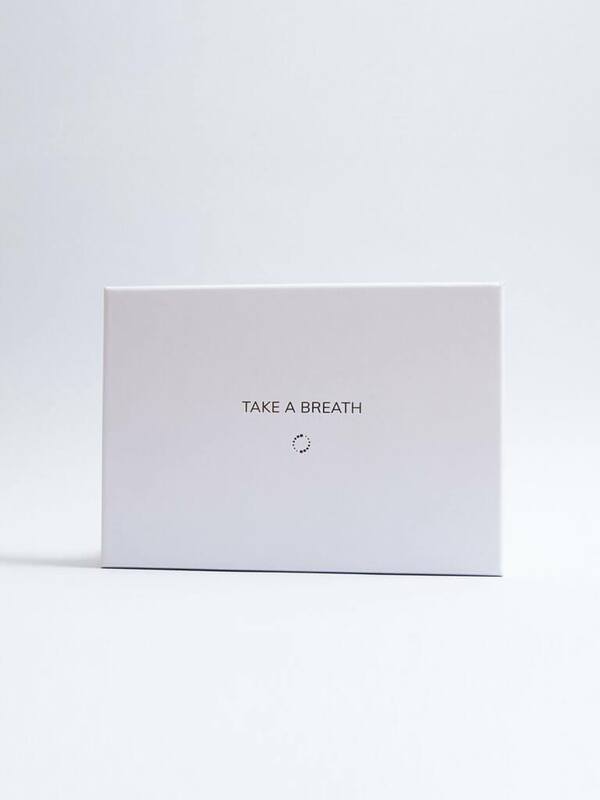 Comes in a ‘Take A Breath’ gift box.